This bulbous perennial has lance-shaped green leaves and bears dense racemes of oblong, violet-black flowers with crowns of paler, sterile flowers. Height is 8 inches. 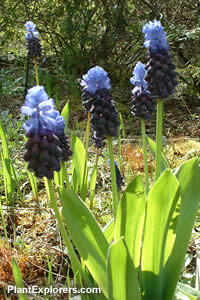 The genus Muscari is now in the family Asparagaceae. For maximum freshness, please keep seed refrigerated in its original packaging until it is time to plant. Sow seed in a cool greenhouse or cold frame in spring. Grow on in any good garden soil with good drainage in full sun. Bulbs will attain flowering size in 2-3 years.